An international conference In Paris, France bringing more than 20 countries together in a coalition against the Islamic State in Iraq and the Levant (ISIL, or ISIS) was meant to discuss strategy to defeat the extremist group. Instead, it kicked off with Iraqi Prime Minister Haider Al Abadi blaming the lack of international support for ISIL’s military gains, the most recent of which was the surprise takeover of Ramadi, the capital of the restive Anbar province. Al Abadi said that world powers had failed Iraq, and added “we are relying on ourselves”. The Obama administration has defended its approach to dealing with ISIL. US Deputy Secretary of State Antony Blinken said American-led air bombardment of ISIL positions in addition to providing the Iraqi military advisors and weapons was part of a “winning strategy”. But Al Abadi said an aerial bombardment campaign was insufficient. “It’s too little. Surveillance is very small. Daesh [ISIL] is mobile and moves in small groups,” said Al Abadi. Iraq’s military, which is being trained by US experts, has nonetheless been criticized by US officials for lacking the will to fight. In Ramadi, as in Mosul a year earlier, Iraqi soldiers appeared to abandon their positions and retreat. “What apparently happened was that the Iraqi forces just showed no will to fight,” US Defense Secretary Ash Carter told CNN on May 24 after Ramadi and the ancient city of Palmyra in Syria fell. “They [Iraqi army] were not outnumbered. In fact, they vastly outnumbered the opposing force, and yet they failed to fight, they withdrew from the site, and that says to me, and I think to most of us, that we have an issue with the will of the Iraqis to fight ISIL and defend themselves,” he went on to say. The unusually candid criticism set off a flurry of angry rebukes in Baghdad and a fierce debate about Iraq among Washington policy-makers. It came weeks after US military advisors warned that the Iraqi army is years away from fully neutralizing ISIL, let alone liberating Mosul, Iraq’s second largest city, in the north. On Tuesday, during a press conference with Al Abadi and Blinken, French Foreign Minister Laurent Fabius reiterated Western “determination to fight the Islamic State”, but acknowledged that “it is a long-term battle”. In hopes of quickly removing ISIL from Iraq, Baghdad has relied on thousands of pro-Iranian Shia militia – as used to liberate Tikrit in April. But the US has cautioned that this tactic only drives a further wedge in the sectarian divide and could push Sunni tribes to sympathize with, if not outright support, ISIL (which is entirely Sunni). The liberation of Tikrit was itself not without controversy: tribal and city leaders accused Shia militia of looting, burning homes, and in some cases, killing people accused of helping ISIL. A plan by Al Abadi to arm Sunni tribal fighters to take on ISIL was called off when his Shia party allies criticized the approach. On Tuesday, Al Abadi assured Arab and Western allies that he was placing more Sunni commanders in the front lines. 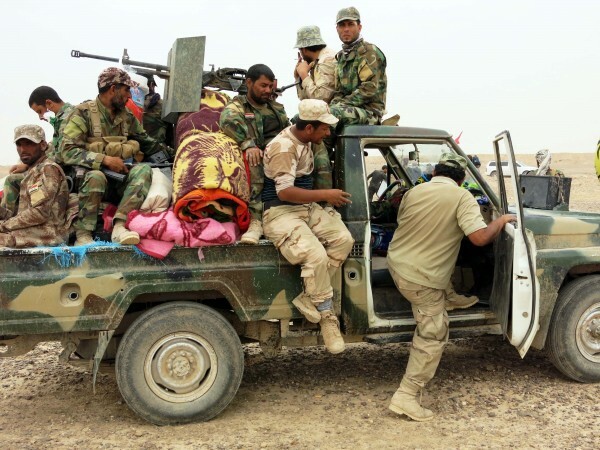 However, for the time being, it is Shia militia which operate beyond the military’s jurisdiction that are taking the lead in the counteroffensive for Ramadi. Al Abadi has called on allies to provide more intelligence and advanced weapons. The US says it is ready to supply the Iraqi army with advanced anti-tank weapons, while Russia says it has been providing weapons and aircraft for more than a year. But Russian Foreign Minister Sergey Lavrov said that the US-led coalition combating ISIL was a mistake because its mandate had never been agreed by the UN Security Council. He also called on the UN Security Council to investigate how ISIL finances arms purchases and recruits mercenaries from around the world. On Tuesday, Al Abadi said that thousands of fresh foreign fighters had infiltrated Iraq and joined ISIL in recent weeks. “We want to cut the financial links of ISIL… We need to cut off any oil purchases on the territory controlled by the terrorists,” Lavrov said on Tuesday. Even as the US and its allies have staged multiple air strikes on Islamic State targets in Syria and Iraq since last year, Russia has insisted that major impact in the fight against the group would come from straining financial support for the group. Moscow has alleged that US-led coalition against ISIL coalition does not coordinate its operations with the Syrian government.